The Fair Credit Reporting Act was legislation that put in place consumer friendly credit practices, including allowing consumers to obtain one free copy of their credit report from each of the three major reporting agencies each year. The three agencies include TransUnion, Equifax and Experian. While you get your credit report for free, getting your actual credit score used by companies in determining your creditworthiness could cost you a little bit more. For example, when you order your free credit reports from AnnualCreditReport.com, you can also get your credit scores for a small additional fee. That's not the only way to get your scores though – there are even some free ways to get your scores which I'll list below. Let's look at the FICO score first since it can be the hardest one to come by. To get your FICO score, you can enroll in one of the credit monitoring trials below. Once you obtain your scores, you can check out the service at your leisure. If you cancel the trial before it expires, you will not be obligated to pay. 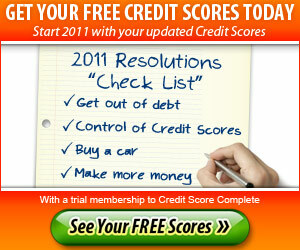 The following is a list of web sites that offer either free 3-bureau credit scores or free FICO score (updated 3/15/2011). Not sure you want to sign up for a free trials and risk forgetting to cancel? Instead you can get your FICO score from Equifax for a $15.95 one-time fee. Another option to get your FICO score is to request your scores through AnnualCreditReport.com and pay the additional fee to get your FICO. Your FICO credit score isn't the only one to monitor. You can also get a credit score from Equifax, TransUnion, and Experian — the three major credit reporting agencies. Here's how to get them for free. Through Equifax 3-in-1 Monitoring with Credit Score 30-day free credit monitoring trial offer, you can access your Equifax score, tips for managing your score, 3 bureau monitoring and alerts, and up to $1 million identity theft insurance. TransUnion will give you your score directly for a fee. Instead, sign up for the free credit monitoring service at Credit Karma. Credit Karma offers you truly free credit score without giving them a credit card and or other payment. How are they able to give a free credit score? They allow advertising on their website and make money when you sign up for the financial products they offer on their site. I've been using Credit Karma for a few years now, and like the ability to get my score for free at any time. Experian will also give you your credit score for a fee, but there is a free option to get their score as well. You can sign up for the free credit and financial monitoring site Quizzle. Quizzle will give you access to your Experian credit score with no obligation – no credit card needed. The service is subsidized by being a lead generation tool for Quicken Loans, but it is truly a useful financial tool that I've been using for a couple of years now as well. It will give you grades on different aspects of your financial picture from your savings, to mortgage rate to your credit report and score. Check it out, it can't hurt cause it's free! Another option to get your Experian credit score for free is the great new site called Credit Sesame. Credit Sesame is a credit and debt monitoring site that will help you to optimize your debts and find better rates or loan options than you currently have. The best thing? It’s free of charge. The site is subsidized by referrals to financial products like home mortgages, similar to Mint.com. When you sign up you just provide your basic personal information and social security number, answer a few questions, and you’ll be provided with your Experian credit score free of charge. You can get your score updated monthly at no cost! There are other ways that you can get a free credit score, besides the ways mentioned above. Usually it will involve taking out some form of consumer credit – anything from an auto or home loan, to taking out a debt consolidation loan through a company like Lending Club. Auto loan – When you buy a new or used car, if you finance the vehicle the bank or dealership will pull your credit score to see how creditworthy you are, what kind of a loan he can give you, what interest rate you'll be stuck with. Ask them to see your credit score as you do have a right to see it. Home loan – When you apply for a mortgage or refinance an existing loan, the mortgage company will pull your credit score(s). Request to see the information and feel free to ask how it affects your loan. Personal loan – If you take out a personal loan and become a borrower on LendingClub, you will be given access to your credit score. The same may be true of other personal loans. Depending on the lender, and which company or companies they work with, you could be getting only one, or all of the credit scores. In any event, it doesn't hurt to ask to be shown your scores that are pulled, and to use that information to improve your scores, or dispute any incorrect information. Haven't checked your score before, or haven't checked it recently? Check it through one of the sites above!